Some people really value past ATS performance and betting trends in handicapping. Others could care less. If you fall in the latter group then you can quit reading now - this is definitely not the article for you. Obviously, then, this article is a look at 2018 Super Bowl betting trends for both teams both this season and further back, how they have performed in their past Super Bowl appearances, and what has happened when the teams have played each other. The Patriots have had a mixed bag from a betting perspective in the playoffs this year. They easily covered and went "over" in the first game, and they went "under" while not covering in the second game. The story isn't as clear as it seems, though. In the game against the Titans the total was 48.5 and the teams scored 49, while against the Jags the total was 46 and the teams scored 44. So, the difference in the two games combined was less than a field goal. Oddsmakers have done a strong job of setting the total for this team in these playoffs. The team has, like the Eagles, played just eight games this year away from home - the minimum number possible. And they were very nice to bet on in those cases - they are 6-2 ATS in those games. They have also gone under the total in six of those games - including the last four that they have played. The Patriots have been dominant in recent years, and they have been kind to bettors in that time. They are 16-5 ATS in their last 21 games against teams with winning records and 36-16-2 ATS in their last 54 games overall. They also carry momentum forward well - they are 35-16-2 ATS in their last 53 games following a straight up win. And they are 36-17-2 ATS in their last 55 following an ATS loss, so they don't often let negative streaks develop. New England has gone under the total in 10 of their last 14 games overall and in eight of their last 10 playoff games. The Eagles' bettors have been more successful than the Patriots in the playoffs - they have covered the spread in both games. 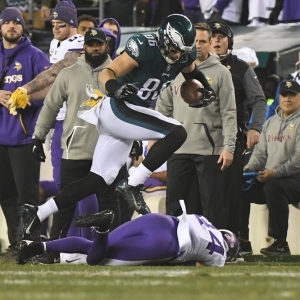 They went comfortably under the total in the game against the Falcons and comfortably over in the game against the Vikings despite the total offensive failure of the Vikings on that day. The Eagles have been a slightly less effective team on the road than the Patriots this year, but still successful - 5-3 ATS. Only one of those road games came after Nick Foles took over at QB though, and they did not cover - he beat the Giants, but only by five as the 7.5-point favorites. They went over the total in five of those eight road games, including the one with Foles. The Eagles are a strong 11-4 ATS in their last 15 games overall and 9-3 ATS in their last 12 against teams with a winning record. They have also carried momentum well - they are 8-2 ATS in their last 10 games following an ATS win. The under has gone 10-4-1 in Philly's last 15 playoff games. If you were to rely only on history then the pick in this game would be clear. The underdog has covered in five of the last six games played between New England and Philadelphia, so the Eagles would be the play on that basis alone. You would also lean towards the over on that same basis - four of the last five meetings have gone over the total. The Patriots have made nine previous appearances in the Super Bowl, winning five. They have covered the spread in their last two Super Bowl games, but that has not been the norm - they are just 3-5-1 ATS in the Super Bowl and 2-4 ATS as favorites. They have also gone over the total in their last two appearances, but that has moved the over to just 5-4 all-time. The Eagles obviously have a much shorter history in the big game - they have never won one and have played in the game only twice. In early 1981 they were favored by 3.5 against the Raiders, and they lost by 17 in a game that went under the total by half a point. In early 2005 they were seven-point underdogs to these same Patriots. They only lost by three points, so they covered the spread that time. Again, the oddsmakers did a good job of setting the total - this time the two teams went under by just a point and a half.